We pray for every curse to be broken over the City of Detroit, even for every curse to be broken in the atmosphere. We tear down the old atmosphere and we speak a new atmosphere over the city. A new atmosphere where God will begin to uproot contaminated political leaders in this city, uproot those political leaders that are non-productive in this city, the ones that lack integrity and do not have the Spirit of God. We speak and we release the political leaders to come into the city council that are going to have God’s heart, that will have God’s Spirit, that will do things God’s way, not man’s way, but God’s way. Even times when they may not be received, even times when they may not be understood, but there will be a time when God will give them results because they did it His way. Thank You Lord for a council that is going to be a praying council, a council that is going to hear your voice, a council that is going to move out on the instructions that you give them. Thank you Lord for raising up a council where the council and the residents will connect together like never before. Lord, we know that You are a God that shows up on the scene when circumstances die, and right now Lord death has come to this city. We thank You God that you are now getting ready to resurrect the desolate places, the waste places. We thank You that You will resurrect in these areas: in the political arena, the residents of the city of Detroit, and prayer in this city. We thank You God that this shall be a city of prayer, a city where the violent in the kingdom of God are going to begin to take it by force. We thank You for the residents of this city coming into unity with the political leaders in this city. We thank You God that you are even going to resurrect our youth here in this city. Father, we thank You for a city government that will get favor with corporations like never before. And Lord we pray for the spiritual leaders of this city that they will not compromise your Word and we are asking right now God that those spiritual leaders that have been compromising your Word and walking in disobedience and rebellion, Lord we are asking that you will begin to take those spiritual leaders down and we are asking that you will begin to take the wicked down. And Father we thank You that this is the year of the transfer. That you are going to transfer the wicked out and the righteous in. This is a year of the changing of the guard, where the wicked shall be removed and they shall be replaced by the righteous. I thank You Lord that the righteous shall rule in this city and they shall reign in this city. And we thank You God for a new move of God in this city by Your Spirit and that the corrupted city leaders, the corrupted political leaders, shall drown in the blood of Jesus. We thank You Lord that this city shall rise up out of the dust, this city shall rise up out of the ashes. And Lord, many have counted this city out, many said this city shall die, many said this city shall not live, but Lord we thank You that you are putting people in position even this year that you have chosen and selected to speak victory over the city. Your voice shall be heard in the mouths of these people that you are raising up in this hour, in this season, and in this year to speak comeback to the City of Detroit and that is the Word of the Lord. God is getting ready to raise up a group of political leaders in the city of Detroit that is going to put the fear of God into man, that is going to put the fear of God into the residents of Detroit. The political arena is going to be very instrumental at bringing the city back and taking a stand for the city. The political arena is the arena that is going to shake up some things in this city, it is going to shake up some things in this community. God is using the political arena to bring this city back to life. Afterwards, the spiritual arena will begin to catch fire, but the political arena is going to spearhead this new movement which is going to be effective and that is the Word of the Lord. The Word of the Lord to the residents of the City of Detroit is that God is getting ready to bring restoration to the Detroit City Council. He is raising up a new generation that is going to operate in integrity, wisdom, and leadership ability to lead the city into victory. And truly and surely a new prosperity shall come over the city of Detroit. There shall be a movement in this city that is going to start through the political arena and many spiritual leaders in the city and the residents shall connect with this movement and that is the Word of the Lord. The Spirit of the Lord is getting ready to restore block clubs in the city of Detroit. Block clubs are going to increase in membership, strength, and unity; and are going to begin to take their blocks and streets back by force. There is getting ready to be a resurrection with block clubs in the city of Detroit. Block clubs are getting ready to come into a new conjunction with political leaders and spiritual leaders. Truly and surely God is moving in the city of Detroit in this hour and that is the Word of the Lord. See the article below where this Word was originally spoken in the Michigan Chronicle during August of 2011. The Spirit of the Lord is saying to the city of Detroit that God is getting ready to bring restoration to our youth. Great progress is going to be made in the area of our youth in an arena of discipline. Much change is coming to our youth in this city even with our youth not wearing their pants hanging down. The Spirit of the Lord is saying unto the residents of the city of Detroit that crime is getting ready to be lowered in the city of Detroit. The percentage that crime is at currently, that percentage is getting ready to be lowered. And truly and surely the residents shall know that God is moving in the city of Detroit and that is the Word of the Lord. The Spirit of the Lord is saying unto the residents of the city of Detroit, God is getting ready to break the curse off of the city of Detroit. He is uprooting ineffective political leaders in this city. Those ineffective political leaders are being removed and God is replacing them with leaders of productivity and integrity. This is a time in the city when God is placing spiritual authority and those with spiritual foundations into political offices. And as that occurs, the curse over the city of Detroit is going to be broken. The Lord is going to usher new ideas and new inventions to these political leaders and as that happens, the city is going to begin to come into a new level of prosperity. Truly and surely increase is getting ready to come to the city of Detroit and that is the Word of the Lord. The Spirit of the Lord is saying unto the residents of the city of Detroit, there is a spiritual movement that is about to occur in the city of Detroit. The spiritual movement that is about to occur in the city of Detroit is going to come through prayer. Residents in the city of Detroit are going to begin to come into a new gathering that God is about to do in the city. God is going to begin to gather up prayer warriors and intercessors and they are going to seek His face. They are going to come into an arena of gathering together and will begin to have prayer rallies and marches outside in the community. Other prayer warriors are going to begin to get in on this spiritual movement that will be going on in the community. The city of Detroit and the residents of the city of Detroit are going to begin to come into a new unity with each other where they are going to begin to see the power of God move through this city like never before because of the curse being broken off of the city. Truly and surely many people from around the community shall begin talking about prayer; what prayer has done for the city and about what prayer is doing for this city. Prayer is on the rise in the city of Detroit. There is a new freedom and a new liberty getting ready to flow through prayer like never before in this city. The community shall see God move through prayer in this city like never before and the city of Detroit shall rejoice over how God is restoring the city. And that is the Word of the Lord. The Spirit of the Lord is saying to the residents of the city of Detroit that God is going to a place a king over Detroit who shall rule for many years in this city with righteousness and order. God is raising up an Old Testament king who shall rule and reign in the city of Detroit for many years to come and that is the Word of the Lord. The Spirit of the Lord is saying to the residents of the city of Detroit that God is bringing Detroit into a new era, an era where God is placing those with spiritual authority and with spiritual foundations into local government and as this occurs a shift is going to come to Detroit City Council whereby the council will begin to prosper and this prosperity will begin to spill over to the city of Detroit and the city shall prosper. And that is the Word of the Lord. The Spirit of the Lord is saying to the residents of the city of Detroit that a new honor is coming to righteous leaders in the community. 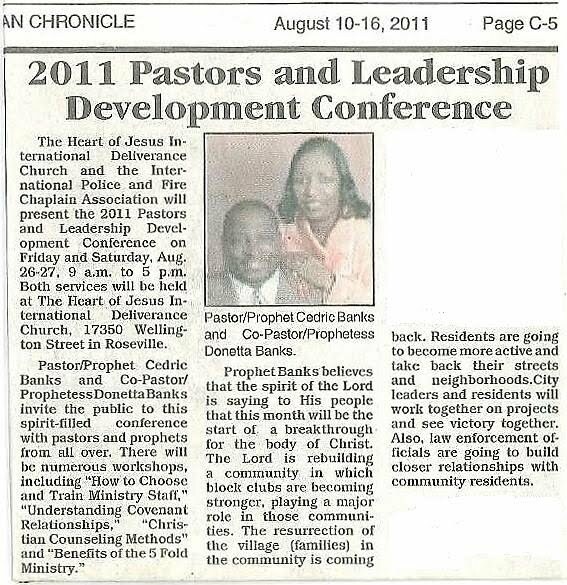 God is getting ready to place a new honor on righteous leaders in the community and they shall flourish saith the Lord. The Spirit of the Lord is saying to the city of Detroit that the lost money shall be found. God is moving in this hour regarding finance for the city of Detroit. One of the areas where God is moving is that God is sending investors from different counties that are going to invest in this city saith the Lord. The Spirit of the Lord is saying unto the city of Detroit and the residents that the city of Detroit has entered into a new era. And in this new era God is getting ready to rain upon the desolate places in this city. Things that have been desolate for many years, situations that have been desolate for many years, circumstances that have been desolate for many years, God is getting ready to rain new life upon the desolate places and desolate situations in the city of Detroit. The city of Detroit, God is getting ready to rain new life upon this desolate city. New life is coming to a new Detroit city council and surely and truly new life is getting ready to be breathed into desolate places and desolate circumstances in this city and surely the residents in this city shall see this move of God and shall rejoice in this hour saith the Word of the Lord. The Spirit of the Lord is saying to the residents of the city of Detroit that God is exposing corruption in organizations and corporations, and bringing order to this corruption saith the Lord. The Spirit of the Lord is saying to the residents of the city of Detroit that the residents are going to begin to come together in a new unification and a new agreement. Unordinary projects and situations are going to begin to occur in the community and the people are going to begin to come together and work together on these projects in unity and that is the Word of the Lord. The Spirit of the Lord is saying that God is getting ready to restore; restoration is coming to the people of God. God is getting ready to restore to those areas in His people that the enemy has stolen from. Restoration is going to begin to start this month of September 2013 and it shall remain going forward throughout the rest of this year until December 31, 2013. And truly and surely from Sept 2013 to the end of Dec 2013, God shall restore to the righteous, and the righteous shall surely begin to flourish over these next 4 months, and recover things that were stolen, and recover things that were lost. Starting in the month of Sept, the righteous shall recover. This is a season of restoration and a season of recovery for the righteous saith the Word of the Lord.